I’ve updated another “old” (read: tried and true) printable. This is one of those printables you don’t know you need until you try it – then you won’t want to live without it during the holidays ever again! So much of my inspiration comes from filling my own needs. Before I created this printable, every Christmas season I end up taking my Gifting Lists (See Gifting Lists HERE) and Holiday Budget (See Seasonal Budget HERE), and then making a new paper with the list of all the stores I need to go, with all the things I need to buy at each store. It can be a very long list! It is so convenient, though, when I am out running my errands and I know exactly where I need to go. Who wants to run a bunch of errands only to get home and realize you forgot things and need to go back to the same places again?! Maybe an alternate name for this printable could be the Errand Efficiency Printable? Ha! Here is the printable, so you can organize your shopping and errands like I do! 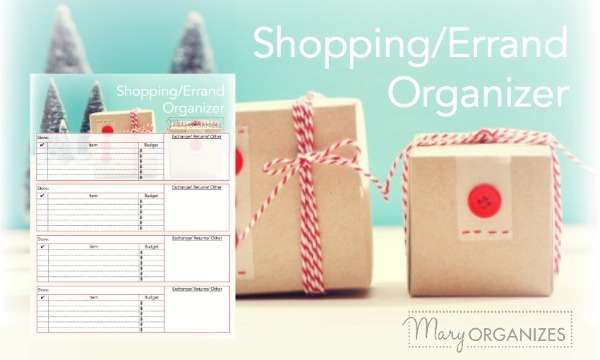 Download the Shopping and Errand Organizing Printable HERE. I ordered th printable 91 day challenge and did not get to in my email. How can I get this sent? This is often because of some typo with email address in the order. Please email at mary@maryorganizes.com (getting the email from you helps me make sure I’m replying to the right email). I’m happy to help! It came with the freezer. Maybe you could check if your freezer has an accessory that will go with your brand/model? Could you send me a link for the freezer? Or just tell me what size it is? I am looking to buy one but am overwhelmed with the size options! Thanks I’m advance. Love your posts – so helpful. I bought this so many years ago, I don’t have a link anymore. It is a little smaller than a fridge, though. I would measure the space you want to put it and find one that fits your space. I just recommend that it is upright, because that is why I love mine!